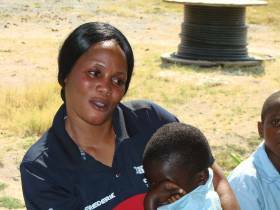 On the border of Zambia and the DRC, near to the city of Ndola, lives a solo mother who has been trained in orphan care and how to set up care programmes. Doris Nkausu has identified 36 vulnerable orphans who live in this border area and who come to her church. The plan is to send the children to school, give them a meal once a week and run a programme with them, and ensure they are being well cared for. They also run a Foundations for Farming training programme with the aim that the guardian families will increase their household income to help care for their own children. After training all the orphan's guardians they have extended the trainings to other people in the community including vulnerable youth. Doris' extended family help her with this work. Sadly Lemon passed away in 2017 but the family continues to help others in the community. Doris Nkausu attended Teen Mission Training in 2004. On graduation she wanted to go to a rural area to care for children but could not raise the required funds to do so. 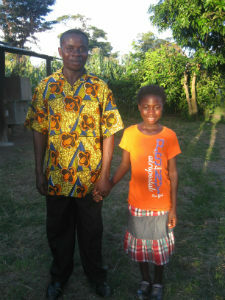 She therefore returned to her father's house in Kaniki, Ndola. She became aware that in the community around her home there were many vulnerable children and she had compassion for them. Doris began helping a family that were destitute. After talking to the Bright Hope World Africa Director she realised she should look a little closer to home in terms of identifying vulnerable children to care for. She now has 36 children she is having some input into, these children come to the local church she attends. She started by assisting these children herself, getting them together on Saturdays and helping them grow a little garden. The plan is for them to gather each week for a programme at her home and to assist them to go to school. 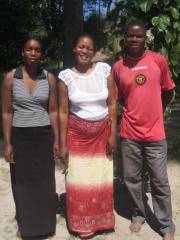 In 2010 Doris and her father Lemon attended a Foundations for Farming training course at Maplehurst farm. Since then they have been learning and using the techniques in both their own and the orphan's field. Since 2012 they have been running training courses for guardians of the orphans and provided them with small plots on Lemon's farm for them to start using the techniques. There have been great results lifting yields by up to 500%, thereby helping families to increase their household income and enabling them to fund the orphans into school. The 36 vulnerable children and the guardians of the children who are benefiting through the Foundations for Farming training. Doris is very keen to assist these children, in fact she was already doing this before we got involved. We imagine this project will continue to grow in the future as she initially started with just 11 children and now is helping 36! Doris Nkausu attends the Baptist church at Kaniki and is a Sunday school teacher and choir member. She lives with her father (Lemon), mother, sisters, and nieces. She has a son named Chisenga whose father died when he was just five months old. 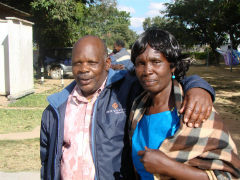 Chisenga’s father died before he and Doris were able to get married. Doris passed through a very hard time having a small baby to look after and no income. It became increasingly difficult for Doris when Chisenga started to go to school. She said that she cried a lot because she couldn’t manage financially. At that stage in her life she didn’t know God very well. Doris attended Teen Missions for three years. 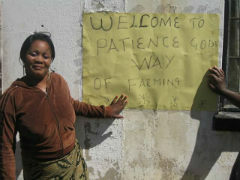 This gave her sound Bible training and a lot of practical experience working with children and farming. "I like God a lot, I love to sing. I am a business lady and have had small businesses in the past. In my life I would just like to be a mother to children who have no mother. I want to have a house and keep them. This passion started with my son. I saw how he felt not having a father. Then at Teen Mission I saw how children were even worse off with no parents. They were so poor and I felt compassion, I wanted to help them. God put this burden on my heart. When I think of my son with no father I feel bad. It is hard to lose parents." Chisenga has now nearly completed a mechanics engineering course after attending the GLO Bible college GAP Year (ZAM19c). He hopes to use this to continue looking after his wider family. The vision is to care for the vulnerable children in the Kaniki community that are connected to the Baptist Church there. The strategy is to assist the children to attend school and to get them together regularly to teach them and train them in basic farming so they can look after themselves. These three girls came to talk with us about the orphans' program and their lives. They are in Grade 10 and 11. They all speak great English and are well spoken young women. They all say they are so thankful for Patience Orphan Programme otherwise there would be no education in their lives. They attend school in town which means they have to travel each day by bus which costs 15 ZMK each day (US$1.50). They all live near Lemon's house and visit Lemon and Doris regularly. In fact, Mary is the daughter of Joseph Kungwa who was in the very first intake of students at GLO Zambia when BHW's Field Director was the principal. They find life can be a bit boring where they live with little in the way of recreation activities. They are able to play some football and netball at GLO. All of them are saying they would like to become nurses when they finish school as that way they can help people. Mr Kafwala was trained in 2012 in the Foundations for Farming methods. He has a daughter who is on the orphans' programme called Hidah. Hidah was disabled from birth and struggles with learning but they are looking after her. She is currently 9 years old and in Grade 3. She has two sisters that live with her and her mum and dad. They rent a property on the Nkausu's farm and he has planted 1.5 limas of maize this year. It is looking good but they need the rain to develop the kernels on the cobs. He planted on the 15th December and used D compound and urea fertilizers.